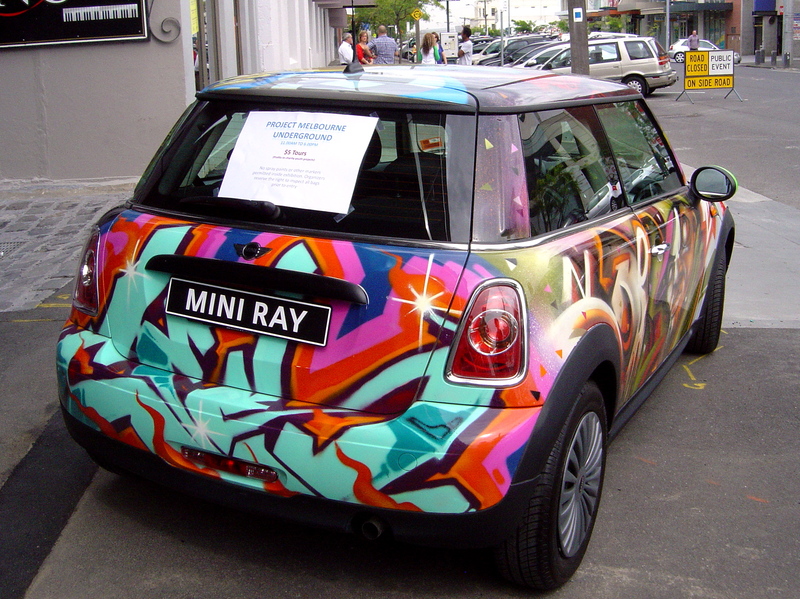 The beautifully painted mini parked out the front was an excellent announcement of the exhibition on 3 floors of the underground carpark of Emerald House in South Melbourne. 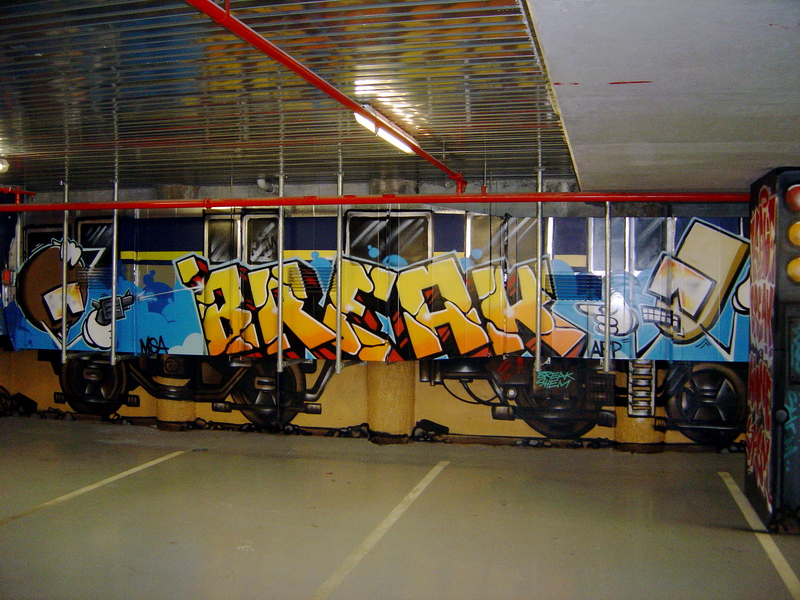 I mean almost every wall and pillar in the whole carpark – the ventilation ducts were painted to look like different types of trains. 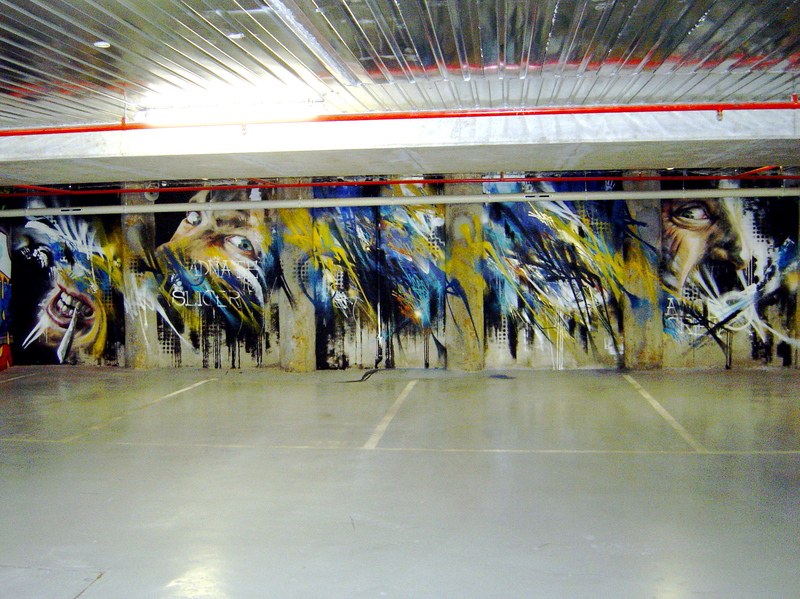 It is huge, “covering more than 800 square meters of space” and claiming to be “Australia’s largest private exhibition of graffiti art”. This is what the Medici’s carpark would have looked like in the Renaissance, if they had a carpark and cars. This impressive exhibition has work from 90 local and international artists. 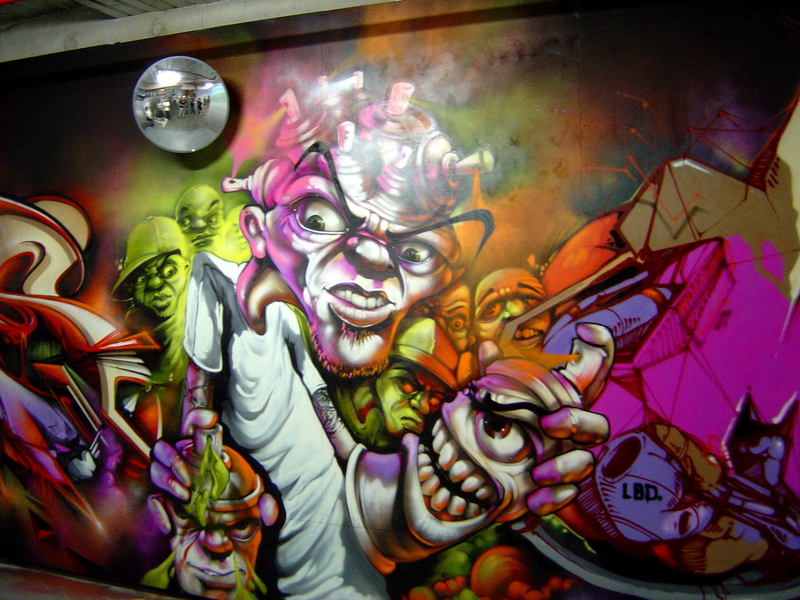 It features many of Melbourne’s well-known aerosol artists, along with some paste-ups from Urban Cake Lady. The only obvious stencils were by Kirpy, Vexta and Stabs, although a lot, like Duel, were using stencils for background patterns. There was also some brushwork from a few artists. With so many impressive pieces on show it would take me forever to finish this post if I commented on all of them. 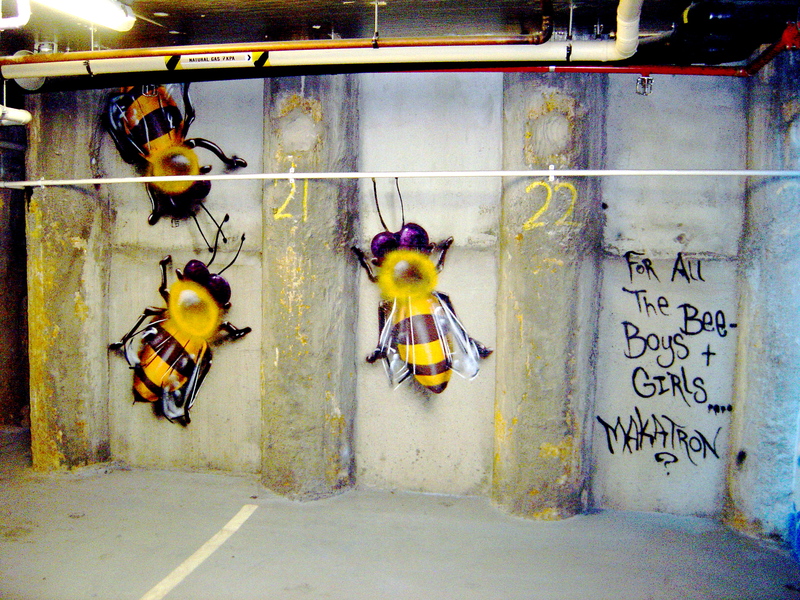 There was Makatron’s wall of bees – “for all the bee boys and girls”. 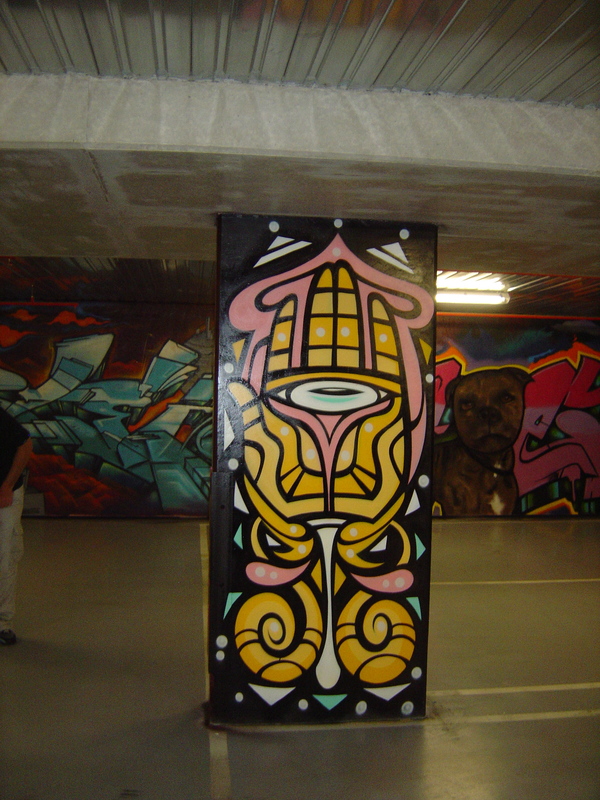 And Phibs’s style worked so well on the pillars. The main problem with this exhibition was how they handled the public – everyone wants to re-invent the wheel. The idea of having artists leading tour groups around might sound good but it meant hanging around the entrance for an artist who had no experience in leading a tour group hoping to wing it with impromptu comments and couldn’t answer my first question about who did a piece. 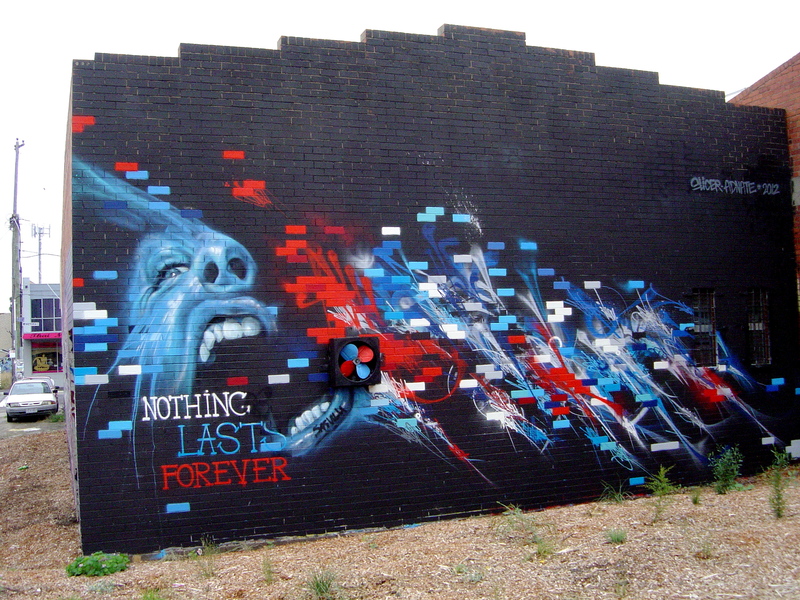 Who is the artist who did this wall and another magnificent piece, also with Monster, at Sparta Place in Brunswick? Answer: Werner “Nash” Zwakhalen. On my way back home I saw the AWOL crew working on the wall at Brunswick Station. At the time they had a few outlines up and were carefully moving a long strip of masking tape from one part of the wall. The AWOL crew have taken their collaborative approach painting a wall to a whole new level. Isn’t this the dream of all painters to completely fill you field of vision? You can see more and better photos of Project Melbourne Underground at Land of Sunshine – part one and part two. Yes, I know, you just want to look at the pictures. 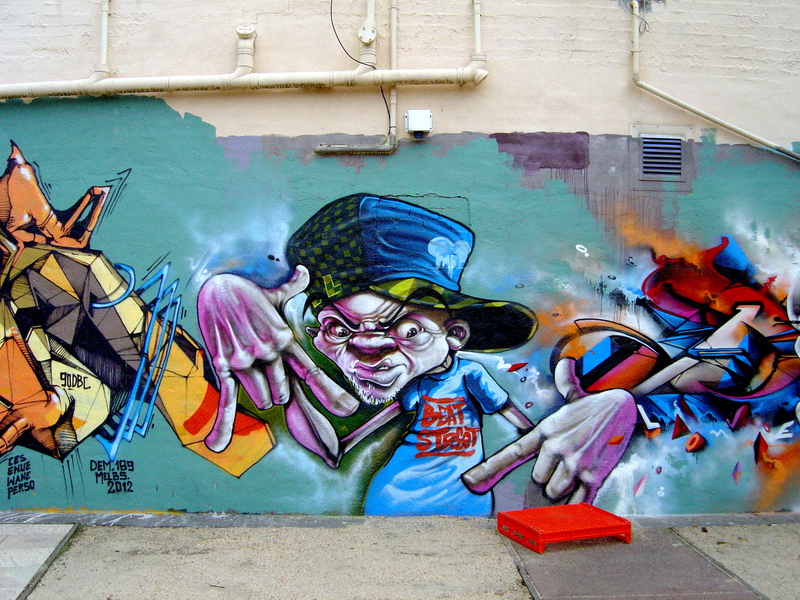 This entry was posted on Sunday, February 19th, 2012 at 4:00 PM	and tagged with AWOL, Brunswick, Emerald House, graffiti art, Kirpy, Makatron, Nash, Phibs, Project Melbourne Underground, South Melbourne and posted in Street Art. You can follow any responses to this entry through the RSS 2.0 feed. Mark,I do apologise- I called you Matt. People can also see more on my Flickr site: street tart 1. I thought that you called me Mark so no offense taken due to not listening to half of what you were saying. hope you liked the car park and thanks for the links! Hi Dean, It was great to see the car park, it is really impressive. I will use more links to your site when I next write about yarn bombing. Cheers. Nice painting, Nice to see the post. Thanks for sharing.